RSV (respiratory syncytial virus) causes respiratory infections that are very common in infants. A 3D rendering of a live-attenuated RSV particle, captured in a near-to-native state by cryo-electron tomography. 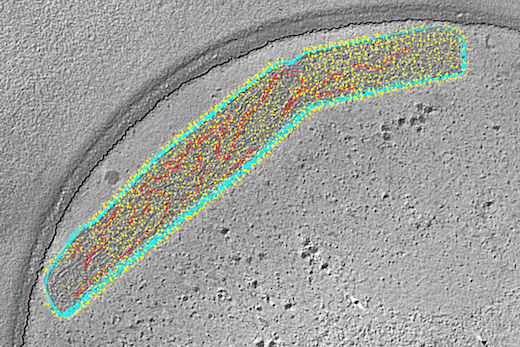 Surface glycoproteins (yellow) are anchored on the viral membrane (cyan), with ribonucleoprotein complexes inside (red). Image courtesy of Zunlong Ke and Elizabeth Wright. Researchers at Emory University School of Medicine and Children’s Healthcare of Atlanta report that they have engineered a version of RSV that is highly attenuated – weakened in its ability to cause disease – yet potent in its ability to induce protective antibodies. The results were published on Dec. 21 in Nature Communications. "Our paper shows that it’s possible to attenuate RSV without losing any immunogenicity," says senior author Martin Moore, PhD, associate professor of pediatrics at the Emory University School of Medicine and a Children’s Healthcare of Atlanta Research Scholar. "This is a promising live-attenuated vaccine candidate that merits further investigation clinically." RSV is the number one cause of pneumonia deaths in children worldwide and one of the top causes of infant hospitalization in the United States. Most are infected in the first year of life, according to the Centers for Disease Control and Prevention. "Achieving that balance is a challenge," Moore says. "Weakening RSV by passage hasn’t worked out satisfactorily. It turns out that for RSV, the natural virus does not induce a lot of immunity itself." Instead, Moore and his colleagues engineered RSV to enhance production of a key protein, called F (for fusion). F is critical for RSV’s ability to enter cells and is the target of several vaccines in development. By making mutations in the viral gene that encodes F, the researchers also made the virus more stable with respect to heat, which could help vaccine manufacturing and distribution. At the same time, the researchers removed or weakened several other viral genes that promote infection and suppress the immune system. One measure of this is that the modified virus, called OE4, stimulates high levels of antibody production. When examined via cryo-electron microscopy and cryo-electron tomography, OE4 virions were structurally very similar to standard RSV virions. The researchers used techniques that allow the virions to be preserved in their native states, says co-senior author Elizabeth R. Wright, PhD, associate professor of pediatrics at the Emory University School of Medicine. Wright is director of the Robert P. Apkarian Integrated Electron Microscopy Core, and a Georgia Research Alliance Distinguished Investigator. A Georgia Tech graduate student in Wright’s lab, Zunlong Ke, analyzed cryo-ET data and found that that the majority of F proteins on both viruses preserved immediately after budding was in the pre-fusion conformation, while immuno-EM experiments revealed that OE4 had higher levels of the pre-fusion form of the F protein and lower levels of the attachment protein called G. This is the structural evidence that the vaccine candidate (OE4) is highly immunogenic though highly attenuated, Wright says. Emory has optioned the vaccine technology to a startup company, Meissa Vaccines, Inc. Moore co-founded and serves as chief scientific officer for Meissa Vaccines, Inc. Moore, Stobart, Rostad, and co-authors Anne Hotard and Jia Meng are co-inventors in a patent application describing the RSV vaccine reported in the Nature Communications paper. The research was supported by the National Institute of Allergy and Infectious Diseases (R01AI087798, R21 AI101775, U19AI095227, T32AI074492), the National Institute of General Medical Sciences (R01 GM114561), the Georgia Research Alliance, the Atlanta Pediatric Scholars program (K12HD072245) and a pilot grant from the Emory/Children’s/Georgia Tech Center for Childhood Infections and Vaccines.